Savior or Meddler? Macron's Drive to Promote French Language Proves Divisive - Integration Through Media ....! 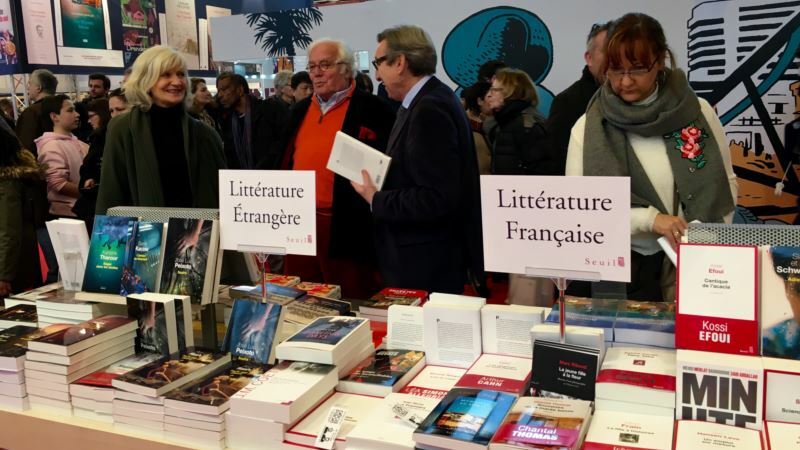 (VOA): Crowds stream out of the annual Paris book fair, shopping bags piled high with the latest harvest of French novels and biographies. But the stands dotting the cavernous hall outside the capital also feature literature from Russia, Africa and Canada, reflecting just how far the language of Molière has traveled and changed. By 2050, the numbers of Francophone speakers are expected to almost triple to 700 million, according to the Paris-based International Francophonie Organization, with 80 percent of them in Africa. But today, despite its status as a top official language, French is in retreat at international bodies like the United Nations and European Union. ​But maybe not for long. That, at least, is the thinking of President Emmanuel Macron, who on Tuesday will propose a grand plan for promoting French internationally. His blueprint, coinciding with International Francophonie Day, aims to make good goals to turn French into the “premier language in Africa,” and possibly worldwide. “The radiance, the attractiveness of French does not just belong to France,” Macron said during a keynote November speech in Burkina Faso, aimed to open a new page in French-African relations. But Macron’s linguistic drive is deeply controversial, saluted by some for shoring up an arguably embattled language, and denounced by others as a riff on neocolonialism. French and the broader concept of “Francophonie,” argue a number of African critics in particular, is alive and thriving without any meddling from Paris. To be sure, Macron is hardly France’s first leader on a mission to save French, which became the country’s official language in 1539. Former center-right president Jacques Chirac walked out of an EU summit after a French business leader spoke in English. His successor, Nicolas Sarkozy, insisted immigrants to France must master French. In France, long-established quotas ensure a certain number of French songs and movies are aired on radio stations and cinemas. Regional languages, once considered threats to national unity, have only flowered in recent decades. Most recently, Macron followed a long-established government line in rejecting demands by Corsica’s ruling nationalists to make the Corsican language official. Ironically, Macron is also the country’s most anglophile president in recent history. Some French sticklers are aghast at his penchant for peppering his discourse with anglophone phrases and slogans. Now, his language crusade is drawing strong support at home. A recent poll by French research firm BVA showed the vast majority of French considered their language key for national integration, and about 70 percent said they were prepared to actively defend it. “We're absolutely in favor of the French president promoting the language,” said blogger and writer Michel Le Net, who helped to sponsor the BVA survey and suggested the Francophonie flag should fly alongside French and European ones. At the Paris book fair, teacher and writer Laurence Seibel also hailed Macron’s initiative, partly as a pushback against English. “During the 17th and 18th centuries, France was the leading European language, and I think Macron wants to recuperate some of this past pride and grandeur,” Seibel said, describing the French language as beautiful and musical. French-Moroccan novelist Leila Slimani, tapped by Macron to lead the language drive, wants to give French a makeover, turning a language many consider fit only for the boudoir into a practical business tool. “French is cool,” she told AFP. At the Paris book fair, Quebecois publisher Mylene Bouchard agreed. But others question why France should be leading the language drive, and whether one is needed. French-Congolese author Alain Mabanckou refused Macron’s invitation to help draft a language plan. He suggested in an open letter the president first needed to “prove himself” to young Africans that he had turned the page on a history of French meddling in African affairs. French-Djibouti writer and academic Abdourahman Waberi suggest Macron’s language drive is mere rhetoric. “There is no budget, no tools, not even a mindset behind it,” he says. Beninese publisher Koffi Attedi said French does not need to be saved. Particularly in Africa, he said, it is evolving and growing as the official language of more than a dozen West and Central African nations, and the glue that binds the broader Francophone community.